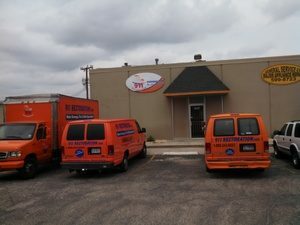 The team from 911 Restoration of Collin County experts that you can always count on to give you the fresh start you’re looking should any emergencies like ceiling leaks and pipe bursts affect your home. We’ll restore your home and make sure it gets back to looking and feeling like brand new! 911 Restoration of Collin County has that fresh start attitude that will ensure your home receives top notch restorations. This attitude, together with our rigorous training and advanced equipment, will make sure any water emergency is handled with the utmost professionalism so that your home can look good as new. A quick response can mean the difference and our water damage Plano team can be there within 45 minutes of your call so we can prevent any serious damage from affecting your home. And once we arrive, you can count on our water damage Plano technicians to get right to work by conducting a free visual inspection. With an inspection, we can get to the bottom of the problem more accurately and we can offer you the best solutions to address it. Another benefit of this inspection is that you can get an affordable estimate for the work your home needs. All the restorations will be performed by our IICRC certified water damage restoration Plano technicians. With that certification, our water damage Plano crew has undergone rigorous training to hone their skills and to be able to handle advanced equipment. Part of the training our water damage restoration Plano specialists have undergone is the use of special water removal tools that can better detect and remove water and moisture from your home. 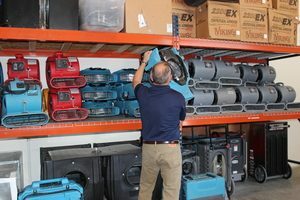 Our equipment includes vacuums, blowers, dryers, and special cameras that will ensure water and moisture are removed thoroughly. For those emergencies that involve exposure to dangerous chemicals or substances, our team will come equipped with hazmat suits. Whenever you need quality restorations done, trust in the water damage restoration Plano team from 911 Restoration to get those floors, walls, and furniture back into shape! Fungal infestations can occur because of prolonged exposure to moisture. Mold can start growing within the span of 24 hours, but it can take as much as two weeks before you start noticing any issues. Mold will feed off of wood which can hasten the deterioration of walls, furniture, and floors. Another problem it can cause is triggering respiratory concerns like asthma because of the spores it releases. Once a leak happens, have your home checked by the mold removal Plano experts from 911 Restoration right away. The process of removing mold from your home begins with our mold removal Plano team inspecting your home. We’ll check for where the leak and moisture are coming from and we’ll remove water immediately. If our scans detect any signs of fungal infestations, we’ll get right to work by applying our eco-friendly cleaning solutions to get rid of the mold. Our cleaning agents will thoroughly clean the affected area without damaging the wood any further. Prevent mold from spreading any further by calling the mold removal Plano experts of 911 Restoration right away! A sewage backup is one of the most dangerous emergencies that affect your home. When the toilet overflows, it can bring in black water which can be filled with all sorts of biological refuse which can cause tremendous harm to your property and can adversely affect your health. These situations usually occur whenever pressure builds up in the sewer system and that pressure is then released into your home. When this happens, call the sewage backup Plano team to clean up that mess immediately. Our hazmat gear will make it possible for us to work on the problem safely. Our sewage backup Plano team will get remove black using our state-of-the-art equipment. Once all the filth has been removed, we’ll be cleansing the area using our industrial strength disinfection detergents to kill bacteria and remove foul odors. Once the area has been disinfected, we can begin restorations that will make everything look good as new. Call our sewage backup Plano team for an immediate response! A fire can cause tremendous damage to any home. The extent of that destruction may make it difficult to repair and restore. But with the comprehensive solutions provided by fire damage restoration Plano pros from 911 Restoration, we’ll make sure you get that fresh start you’re looking for. To ensure that restorations are done right, we’ll take on all the issues a fire may cause which include structural damage, ash, soot, foul odors, and the water used to extinguish the fire. To address all those concerns, first things first. We’ll make sure all the water is removed. We’ll blow off the ash and soot clinging to the ceiling, walls, and vents. We’ll get rid of the foul smoky odor left by the fire. Lastly, you can expect our fire damage restoration Plano team to perform all the structural restorations so your home can look good as new! Flooding and storm damage are disasters that need to be addressed right away. Our disaster restoration Plano experts will make sure you get an immediate response to emergencies caused by storm damage, floods, earthquakes, and other disasters. Our team can be there within 45 minutes of your call and address all the issues for you through complete restoration process. Flooding can cause extensive harm and affect multiple sections of your home. But with advanced equipment at our disposal, we can make sure all that water is pumped out thoroughly. 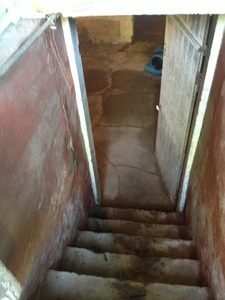 Our disaster restoration Plano team will thoroughly check all the areas of your home such as crawlspaces and the areas between the walls for a complete cleanup of all the water that was in your home. Get the fresh start you’re looking for by having disaster damage dealt with by the disaster restoration Plano experts from 911 Restoration take care of it for you. Give us a call today!